This magnificent treat is made of two cake layers: a cheesecake on top and a brownie cake on the bottom. Sandwiched between the two is yet another layer of sweet treat, a dulce de leche (sweetened condensed milk). The stack is then covered with chocolate ganache topped with crumbled Skors bar. In a small bowl, stir together the graham cracker crumbs and the 1/2 cup of sugar. Add the melted butter and mix well together. Press into the bottom of a 9 inch springform pan. Cover the bottom of the pan with foil to make it waterproof. Next in a large bowl cream together and 1 cup of sugar until soft and smooth. A hand mixer or stand mixer is definitely recommended. Stir in the lemon juice and vanilla extract; be sure to scrape the bottom of the bowl to prevent lumps. Beat in the eggs one at a time, then slowly add Skor chips and 2 of the crushed Skor Bars. Pour the batter over the graham cracker crumb mixture in the springform pan. Place your foil covered springform pan into another cake pan or larger pan with sides, and then fill the larger pan with water to create a water bath (this prevents cracking). Bake for 90 minutes, be sure to check after 45 minutes and refill the water bath. After 90 minutes turn off the oven and leave inside the oven for about an hour. Chill for at least 4 hours before removing from pan. Once chilled sprinkle the remaining 2 Skor Bar crumbs over the top. Just a few notes on the cheesecake, 1) Oreo crumbs were used instead of Graham Crackers, 2) only 1/4 cup of sugar was used for this cake and 3) 4 Skor bars were used instead of chips. Not to mention that you can use any cheesecake of your desire, even those that you can buy premade from the stores. Using a double boiler, melt chocolate and butter while stirring from time to time. Set aside to cool. In a large bowl, whisk eggs, sugar and vanilla. Stir in the chocolate mixture. In a separate bowl, sift flour, baking powder and salt then blend them into the chocolate mix to make a brownie cake batter. Pour batter into a greased 9-inch baking pan and bake for 45 minutes. Set aside and let cool in the pan. Peel off the label from can. Submerge it completely in a pot of boiling water for 2 to 2 1/2 hours. Make sure there are enough water so that the can stays covered. Let it cool then spread on the brownie layer. Combine the cream and chocolate in a double boiler (e.g. Farberware Classic 2-Qt. Covered Double Boiler). Mix until texture is smooth and satin. Let cool before spreading on top of the cake assembly. 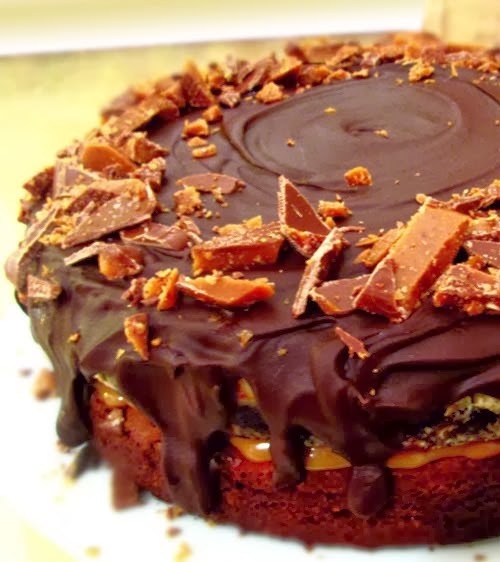 Decorate with crushed pieces of Skor bars before serving. Enjoy! For a more fruity flavor, see recipe for raspberry cheesecake.